Today, I posted as a guest at Paula’s blog, Lost in Translation. She hosts very cool photography’s weekly challenges: Thursday Special Photo Challenge, Black and White Sunday Photo Challenge. The coolest aspect is that she invites guest photographers to share their creative ideas and techniques, and builds a closely-knit community, who joins in. I love to take part in it because it is a high quality challenge, where I not only learn but also meet very interesting people, while having delightful chats with Paula. It was a big surprise when she invited me to guest post on her blog. I lack no self-esteem, but I am self-aware enough to know that I am an absolute-beginner-photography-enthusiast. I shoot more from the feel and the story than the technique, which most of the times I don’t master yet. When I join challenges, and look at what others send in contrast with my choices, I notice that I often digress, and create interpretations that are less photographically correct than others. While it is ok to be who I am, and to make my photos as I please this does not make me a role model or a teacher of photography. I am seriously investing in reading more about technique and experimenting with it, than I ever did, because I know that extreme focus on ‘feel’, is as bad, as extreme focus on ‘technique’! I need to know it better so that I free up my creativity, making more informed choices, and photos that I am happy with. I accepted Paula’s invite, though, perhaps because as a photographer-in-training, I get courage and inspiration from images and quotes from the masters. I also think she is a daredevil to invite me, and I like that. So, bear with me. Hope you enjoy this. I will do my best not to shame Paula’s blog. Thank you for the trust, Paula! It is Black & White Sunday and we needed a theme. I flipped the dictionary to find a word, and there came SQUEEZE. I shivered, wondering what I could make of it. But guess what, it is possible and I am sure you have plenty to share with us. The rest you know: Shoot or use stock photos. Post process it to make the effects you wish, et voilà, you are good to go. The featured image is a macro of the leek vegetable. According to Wikipedia, rather than forming a tight bulb like an onion, the leek produces a long cylinder of bundled leaf sheaths that are generally blanched by pushing soil around them (trenching), which to me feels like squeezing into the soil. 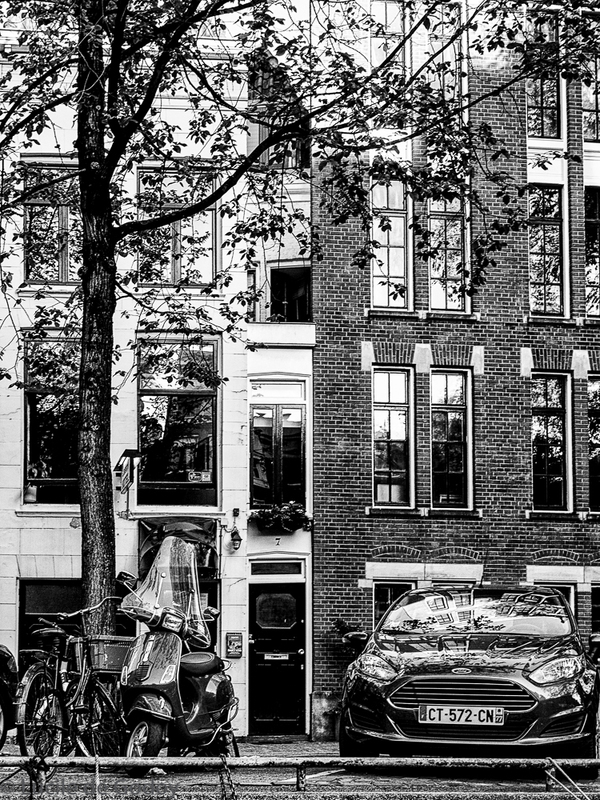 Amsterdam’s architecture is typically squeezing houses and for the lack of space, growing vertically. The first image is house number seven at Singelgracht in Amsterdam, only one meter wide (about 3 ft., 3 in.) and for that labeled as the narrowest house in the world. Right in between the scooter and the car, you can see the door. This is actually the rear façade of a house. The front of the house is actually 7 meters wide. The reason for this intriguing construction is that in the 17th century, residents were taxed according to the width of the building that faced the canal. Taxes were high, so people tried to find creative ways to avoid these. Shot with Olympus E-M10. Converted to B&W with Silver Efex Pro2. Used filter high structure and contrast. The second photo is of haystack. No need to mention the word squeeze, right? While riding my bike I wished I had a better camera with me but my iPhone did a good job. Shot with Iphone5. Converted to B&W in Silver Efex Pro 2 and used high structure and high contrast filter. Added soft black borders. The third photo is in the Vale do Douro in Portugal during winter. 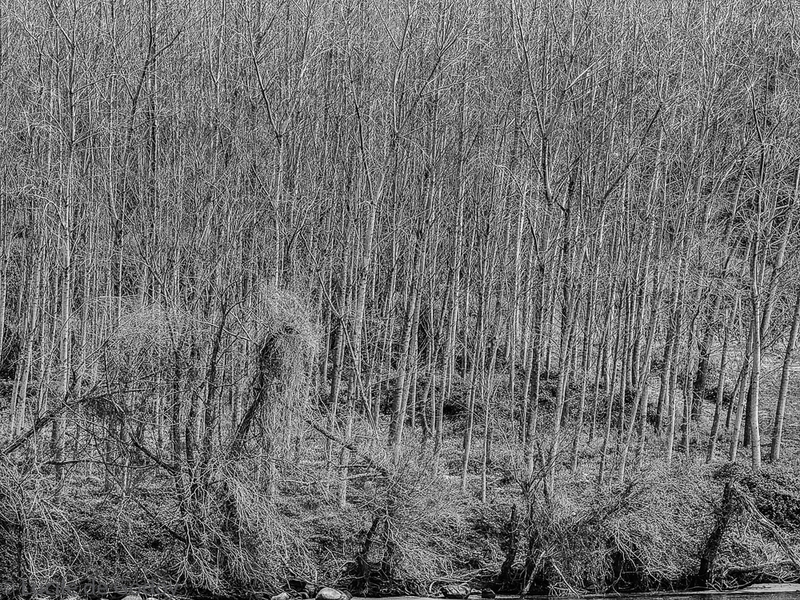 The trees are squeezed and naked. Shot with Olympus E-M10. Converted to B&W in Silver Efex Pro 2. High structure filter (smooth). 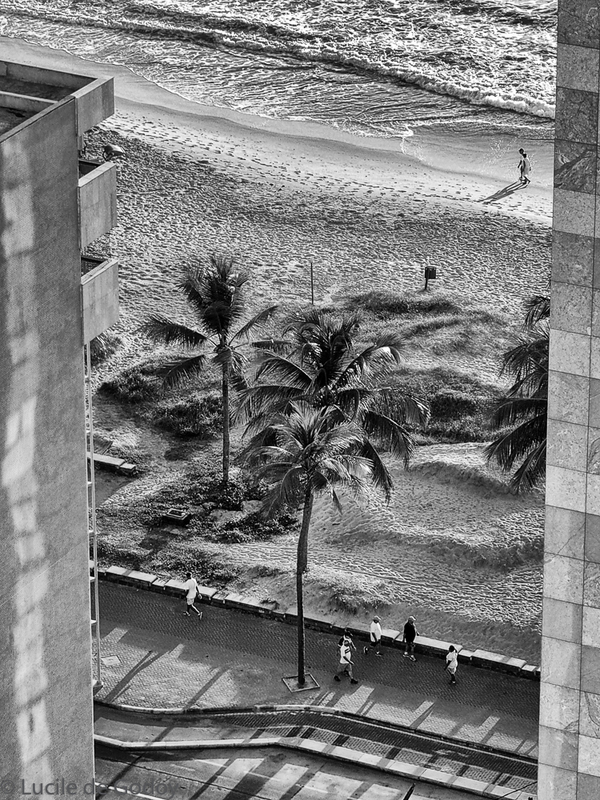 The fourth Photo is at Boa Viagem beach in Recife, Brazil. The sea view totally squeezed between buildings, making people look bottled up while doing their early morning walk. Shot with Olympus E-M10. Converted to B&W in Silver Efex Pro 2. High structure and High Contrast filter. I enjoyed reading this, your reflections on the balance between technique and feel are spot on, a good photographer needs both and to find that correct balance that makes a photo more than just a photo. I think your first shot of the leek does just that, it is a striking image that leads the viewer inside. 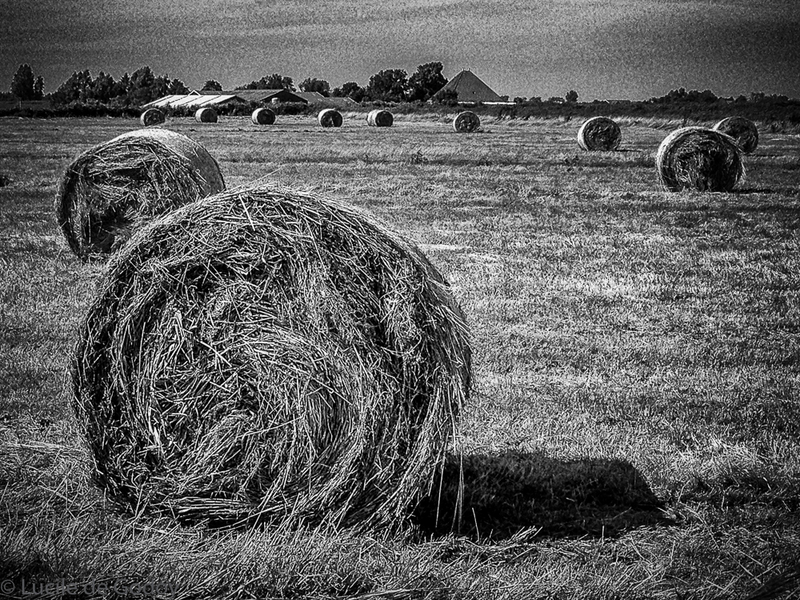 And that haystack is interesting, for me it almost has a menacing feel to it, or perhaps I am too in love with the dark side, great work (again) Lucile! Dang, I was looking for that ‘Like’ button. I love when people create their own interpretations of a challenge, Lucile. Sometimes the obvious never hits my brain, and I find something that I think is just perfect. Well, perfect for my way of thinking, anyway. Your squeezes are awesome. I don’t think I would have thought of these for the challenge–but you have opened my mind to think wide. I love this. Thank you so much Lois, I appreciate your generous and encouraging comments so much. It really means a lot to me. PS> You’re a sweetheart and I feel a tiny bit bad for making you suffer symptoms of a Like-buttton remission. Maybe a Rehab? lol. Doesn’t matter how long you’ve been doing photography or what you “know.” You have the photographer’s eye and are able to translate what you see into beautiful photos. You have a point, Janet, and I agree. Heartfelt thanks for your considerate words. I appreciate them wholeheartedly. I am way more drawn to photos with feel than ones that are technically “perfect”. Also… I don’t think you’re giving yourself enough credit in the technique department. You have a nice mix of both. I love your work. I’m like that too and that’s what gives me license to be myself. I highly respect your opinion and am a fan of your super talented photography, Amy. Your comment meant a lot to me. Thanks. Your photographs have such an emotional punch, amazing. The haystack one is haunting and eerie, the leek one I return to again and again – how did you manage that! Talk about looking at the world from a new angle. Lovely to read about your technique and the story about the canal house. Here in the UK there was a tax on houses according to windows during the mid-1700s which lead to many houses still having the bricked-up windows. The interesting results of taxation eh? I love the photo of the hay bales. Thanks Richard! I appreciate your visit and comment. I never dreamed you thought of yourself as a beginner. Wonderful to see you as the guest host of this challenge. Well deserved recognition from Paula. I wish I could have participated but my travel schedule and inconsistent internet have made me absent from many of my favorite challenges. Maybe when I get settled in Sydney (are ta coming 😉) I’ll participate again.